Ahead of Friday's debut of HomePod, select publications were given early hands-on time with the device. Their reviews were largely mixed, praising the sound of HomePod but finding that Siri just can't compete -- yet. Buzzfeed's Nicole Nguyen was impressed that Siri knew what she meant when she asked it to play the artist SZA -- Alexa played either Sizzla or John Philip Souza instead. But she also dinged Siri for limited understanding of commands: "I don't like this" was not recognized, but "I don't like this song" worked fine. I love it. AirPlay is awesome. 2) All of the HomePods limitations and rudimentary Siri implementations were expected, except for how she connected her iPhone to the HomePod to call her sister. With the Echo, one you've paired it once all you have to say is "Echo (dis)connect" to get you iPhone to switch audio (from any source, including when playing music or a podcast on your headphones and you come in the house after a run) with the greatest of ease. If you really have to manually go into the iPhone instead of just using a simple verbal command then that's another strike against Apple. 1) When you talk about how a product will eventually get better you sound just like all the people that come here saying how Android is the future and just you wait for it to get better. 2a) Siri is Alexa as HomePod is to Echo so to compare Siri to the Echo is, again, sounding just like the silly anti-Apple/pro-Android arguments from trolls on this forum. 2b) Additionally, since Alexa is just a digital personal assistant and you can connect any number of wired and wireless speakers to Echo and Alexa-capable products to create any sound environment that you wish, it's odd to see someone impose artificial limitations. Imagine if someone did a review of the HomePod for use as an alarm clock compared to an Echo Dot and ever tested any of the things the $350 device excels at because all they wanted to see is if it had unlimited alarms, timers, white noise makers, and 3rd-party apps for getting better rest. It wouldn't make sense to gauge the HomePod on that platform just as it makes no sense to compare the $40 Echo Dot against the HomePod for music or make any claim that the Echo can't have any wired or wireless speakers connected for a music comparison despite that being part of its core design. Brian Chen sounds like he's never even used Apple Music before. WhatHiFi had a review and said Siri worked really well in combination with music requests. Does she actually use the kitchen? Its far easier to keep something clean that's never used. But, but, but, but..... snore..... They need to make everything clickbait and putting negative anything Apple is clickbait. So, it basically reflects what Apple said when they announced it... Well, good golly gee that's just great. Lets all buy one, or two, I know I am. I'm guessing she has people that will clean that place just so she can record her vlog. I may have heard the name before I don't think I've ever watched her videos. Overall very well done. The writing could be tighter, but perhaps that part of the charm for her viewers. I liked that they had some CGI to show the internals of the HomePod by her front door at the beginning. 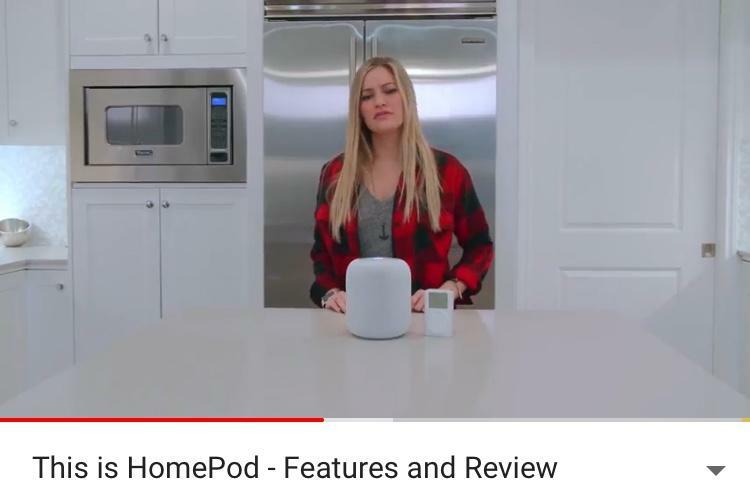 There's mention on her site that she bakes/cooks and she mentioned in the video that she wants to make a HomePod cake. That's an under-appreciated feature to be honest. I use it fairly often.